This male is a perfect example of what genetic advancement is all about and perfectly compliments our program. When both parents are multiple champions, one generally doesn’t expect anything less than a “competition crusher”. Please say hello to our little secret. Our farm plan is to use only outside breedings for our first 3 years of operation. When selecting the perfect male for our best female this guy was high on the list. In fact, he was a great choice for several of our females, so we bought him. A fleece sample caught our interest, amazing structure and crimp, softness and consistency. Then, and only then, did we look at the pedigree, the awards on top and bottom and the awards he earned himself. He’s been out there making a major impact! And crushing the competition is exactly what he is doing….big farm name competition. While we are being a little secretive on his name, we will boast about the pedigree. His sire, AML Nobility has brought home 9 CHAMPIONSHIP BANNERS. He’s won them all, halter, fleece, spin-offs and that is what this industry is all about, amazing fleece on a correct frame. 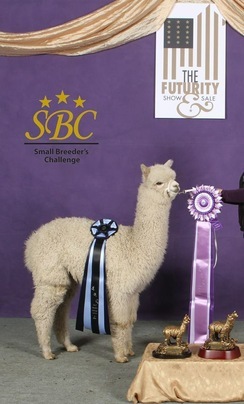 Great genetics including Peruvian Legacy, Peruvian Royal Fawn, Peruvian Grand Master, and only at the 1/16 level (4 generations back) does Hemmingway appear. With both parents as fawns we expect this male let color pass to his offspring. Now he is quietly living the good life on our tiny little farm. We’ll put him to work this summer and see what he can do for our program. Patience, and a plan for excellence, in due time. ** Check out his only offspring, Sundrop’s Jumping for Joy. She is fantastic and bringing home a rack of ribbons for us.